The average science fiction novel takes one or two interesting ideas from recent history and modern science and extrapolates them forward for fun and enlightenment. 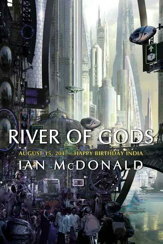 In River of Gods, however, Ian McDonald found a place for a little bit of everything in the caldron of India’s future. Artificial intelligence, climate change, extreme body modification, alien artifacts in space, alternate realities, and cyberpunk-flavored digital warfare all have their place in this enthralling work of near-future science fiction. One hundred years after its founding, the now-Balkanized nation of India is facing both the emergence of superhuman artificial intelligence and a war over water. Being one of the only nations that has not banned advanced AIs, they also find themselves in the unique position to translate the output of an artifact that the Americans have found in outer space. River of Gods covers the events of August 15th, 2047 — the day when these factors (and others) come together and everything explodes. River of Gods was published in 2004, and has a more action-movie feel than McDonald’s most recent novel, The Dervish House. Like The Dervish House, it tells the same story from the perspectives of many different people — a vicious street criminal, a cybercop, a genderless fashonista, a politician, a lonely housewife, a pair of naive computer programmers, a reporter, a comedian, and a prophet. Through their eyes, McDonald draws a picture of a future India that stands on the edge of a technological revolution, but has not yet finished its struggle with poverty and religious bigotry. One of McDonald’s thought experiments is the character called Tal. Tal is a neut — short for neuter and neutral, a self-described noncombatant in the war for genetic survival. The description of what Tal went through to achieve this state is simultaneously frightening and fascinating — the ability of an individual to choose that level of body modification could have been the core of its own novel. Instead, McDonald has Tal embody the emotional and social consequences of this technology. In my opinion, McDonald does a masterful job in drawing a character that is neither male nor female, but still human and relatable. Tal’s fall and redemption is one of the most compelling plot arcs in River of Gods. Seeing the same city in India through ten sets of eyes can be overwhelming for the reader, particularly given McDonald’s dense and image-rich prose. Car chases and judiciously-placed explosions help to hold the reader’s interest. As the book progresses, the cuts between perspectives come faster and faster until they literally converge in an anime-style ball of white light. For me, the end of River of Gods is not as strong as The Dervish House. I felt like the book reaches for a science fictional twist and leaves many of the characters — whom the reader has, by this point, been seduced into loving — spinning off in poorly-defined directions. Despite my (slight) disappointment at the ending, I do recommend this book. If you, like me, miss the glory days of cyberpunk, you’ll find something to love in River of Gods. If you enjoyed The Dervish House or if you are looking for some high-concept science fiction combined with war robot action sequences, political intrigue, and heart-tearing drama, pick up this book. River of Gods is complex, beautiful, and a lot of fun.